With the new 3D collection from Ravensburger you can create fantastic room accessories in 3D! 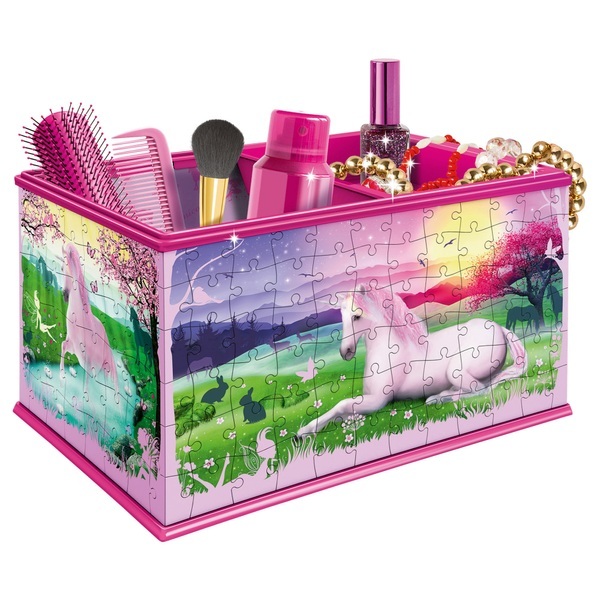 With a stunning unicorn design, 216 strong plastic puzzle pieces are used to create a storage box that will add an enchanting touch to any bedroom. Just complete the puzzle, attach the accessories - and you have a storage box that is ultra-practical with a flexible shelf! Use for anything you like - treasures, letters and bits and pieces! This fantastic storage box from the 3D collection measures over 23cm in width when complete and is suitable for ages 9 and over.